One of the popular courts in Penang is the one situated at Farlim, Air Itam, called Permata Sports Complex. It is a sports complex with tennis courts, squash courts and swimming pool as well, and the indoor badminton courts are often fully booked especially during the weekends. The courts are nicely spaced, and the roof is high enough to allow for good ventilation. Some people may go for a swim after a good game of badminton, and for those who are training professionally, they may opt to go for some weight training at the gym. There is a total of 9 courts altogether in the hall. Since the courts are so popular, operating hours had been extended until 1 o'clock in the morning. 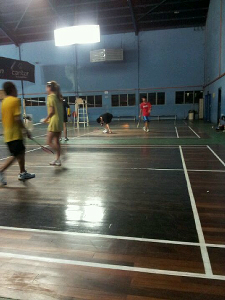 For those who are there ad-hoc, badminton rackets are available for rent at RM1.00 per hour. There is also stringing services at the badminton shop at the entrance of the badminton court that also sells shuttlecocks, rackets and grips. Hence, you may get the full services for your badminton needs while you are playing at the court. The Penang Badminton Center is in Bukit Dumbar, a popular venue for joggers errain. runners through an upward hill terrain. The court there is a little bit dark, hence the need for strong lightings. The courts are usually fully booked, and there is also small shop just outside of its entrance for stringing services, also selling rackets, some badminton clothes and shoes. They have an association running the centre, which is the Penang Badminton Association. Aside from the jogging and running facilities at the Bukit Dumbar, plus the other usual facilities in the recreational parks in Penang, there is nothing else there, perhaps just an Indian temple. However, they do have an in-house trainer for those who are going for professional tournaments. One of the halls in PESTA had been converted into a badminton court a few years ago, and it is run by WRC Sports Enterprise by ex-national player, Ong Ewe Chye. He trains a team of young players there, and the courts are also open for booking. It is a popular court for those working in the Penang Free Industrial Zone and other factories, and some have made regular bookings of the court. Stringing service is available, and there are also some sports equipments too, though not restricted to badminton. Squash and tennis rackets are also available. Each year during the PESTA Pulau Pinang affair in December, there will be a badminton championship which draws players from around Malaysia and from other countries as well. Players from Taiwan and some of Malaysia's big names that had carved their reputation overseas such as Allan Tai had also joined the tournament before, for the fun sake of it. Other players will include the regulars who rent the courts at PESTA and joining the championship is only for the sake of finding an opportunity to play with the stars. There are ten courts available at PISA, although sometimes it can be quite a disappointment when the courts had to be closed to make way for exhibitions and other functions. It will be difficult to make long-term bookings at PISA courts because of this. The badminton court at YMCA is just a small one, perhaps because its original intention was to build the facility for those staying at the hostels. There is a sports shop just next to it where stringing services are available, together with the sales of shoes and sports attire. There are regulars at the courts, and most are veterans. For example, every Friday there are two groups: one group with players in their late 30s and early 40s, while another group are players in their 50s and 60s. Other sports clubs do have badminton court facilities. Among them are CRC, Penang Sports Club and Yesterday Club. They may not have a lot of courts available, and priority is given to their members. Schools may also offer courts such as the Sri Pinang school, Chung Hwa Confusion Primary School, St Xavier Primary School, Chung Hwa Secondary School, Chong Chen Primary School and Universiti Sains Malaysia. Meanwhile, associations such as the Ramakrishna, the Headquarters of the Boy Scout and Girl Guide, St John Ambulance and the Leong or Gan Kongsi also offers their court for rental to public. Some residentials have facilities for their residents, such as the N-Park and U-Garden apartments. Two other unlikely places that have badminton court facilities for rent are Batu Lanchang market and the Island Park Holy Spirit Church. This entry was posted in MM2H Guidance and tagged badminton, badminton courts, George Town, Georgetown, Penang, Pulau Pinang, sports complexes by admin. Bookmark the permalink.